Simple, wonderful stories happen every day. We just need to keep our eyes and ears open. For over a year Resurrection Lutheran Church has been missing a door from a cabinet in our conference room. The small room had functioned as an office for a time with the previous pastor. He asked to have the cabinet doors removed so that the open shelves could function as bookshelves. When I was called as pastor, we determined that the “office” should be a conference room once again and the cabinet doors restored. Our energetic Property Image Team (PIT crew) took up the challenge to re-install the cabinet doors soon after I arrived. The doors had all been stored in the storage room and were easy to re-installed. However one of the eight doors was missing. The PIT crew looked everywhere for the missing door, then the staff and family members turned offices and homes inside out, searching for the missing door. A few of the PIT crew thought it might have been “used” in some church project, but no one could remember. The door remained missing for over a year. The conference room had a slightly “unfinished” look due to the missing door. Ministry and meetings continued to flourish in spite of the absent door, but still the room did not feel right. Our office coordinator, Sue Guck, continued to remind the PIT crew of this “blemish” and finally they agreed to create a new door. The congregation has several talented woodworkers, but they all seemed busy with various projects of their own. Barry Van Ornum agreed to take on the task, but wanted to see if any other woodworkers in the congregation could assist him. Someone on the PIT crew remembered a member who had crafted a Bible stand for our worship center several years ago, so Barry decided to contact him. As Barry explained the project, the member interrupted him. 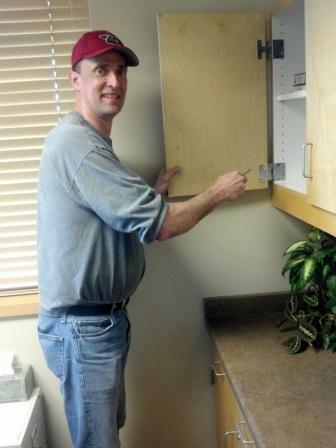 Within three days, Barry Van Ornum had the missing cabinet door and it is now back in the conference room. The unfinished project is now complete. The PIT crew and staff also have a deeper appreciation of Jesus’ Parable of the Lost Coin. “Or imagine a woman who has ten coins and loses one. Won’t she light a lamp and scour the house, looking in every nook and cranny until she finds it? And when she finds it you can be sure she’ll call her friends and neighbors: ‘Celebrate with me! I found my lost coin!’ Count on it – that’s the kind of party God’s angels throw every time one lost soul turns to God.” (Luke 15:8-10 The Messsage). Anyone want to join us for a party in the “restored” conference room after Easter? Lord Jesus, thank you for seeking us out even when we are lost or forgotten. This entry was posted in Bible, Jesus, Resurrection Lutheran Church, service, story, Uncategorized and tagged Barry Van Ornum, cabinet door on March 30, 2012 by Pastor John Keller. It also is a light-hearted reminder to me about patience and how different God’s timing can be from my own. with gratitude to all the marvelous carpenters . . . Thanks for retelling the story. You do it so well. I sure had a fun day that day with everything going on. I like the story of the lost door–I believe it was just misplaced. Barry looks good, too. It was in safe-keeping, just waiting for the right person (Barry) to ask the right question, so it could be re-hung. Gary, Thanks for keeping it safe.